Technological advances in bio scientific agricultural research have meant that scientists are generating vast quantities of data concerning the structure and functions of different genes in living organisms over a shorter period of time. To translate the huge amounts of data produced into practical information such as livestock breeds, crop varieties, differences between breeds, responses to environmental stress etc., there is need for scientists to have the tools to decipher this information. Since 2007, Erik Bongcam-Rudloff, a biologist and computer scientist who heads the Swedish University of Agricultural Sciences (SLU)-Global Bioinformatics Centre has been coming to Kenya to facilitate a workshop aimed at equipping researchers from across Africa with skills in bioinformatics, the application of computer technology to the management of biological information. 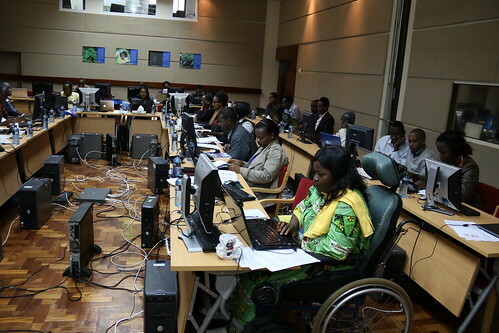 Bongcam’s participation in BecA-ILRI Hub’s annual workshop on advanced bioinformatics is part of a bigger partnership which provides support to BecA-ILRI Hub’s bioinformatics platform, affording BecA access to technical advice and enhanced expertise from SLU, including infrastructure upgrade. This year’s workshop which took place from 18 – 29 August 2014 at the International Livestock Research Institute (ILRI) Nairobi campus brought together participants from national agricultural research systems (NARS) in 13 African countries including Benin, Cameroon, Central African Republic, Congo Brazaville, Democratic Republic of Congo, Eritrea, Ethiopia, Kenya, Madagascar, Somalia, Sudan, Tanzania and Uganda. The program exposed participants to comprehensive lectures and hands-on training sessions in Linux, Perl programming, genomics and next generation sequencing technologies, genome assembly, metagenome and metagenomic analysis tools and their applications to biological research. Other facilitators at the workshop included Isak Sylvin from SLU; Manpreet Katari from New York University; Sarah Schaack from Reed University; Gordon Harkins from South African National Biodiversity Institute (SANBI); Leendert Cloete from SANBI; Mark Wamalwa, Joyce Nzioki and Dedan Githae from the BecA-ILRI Hub; and Alan Orth and Maureiq Edith from ILRI. The workshop is funded by the Australia Government Department for Foreign Affairs and Trade (DFAT) through a partnership between Australia's Commonwealth Scientific and Industrial Research Organization (CSIRO) and the BecA-ILRI Hub; the United Nations Educational, Scientific and Cultural Organization (UNESCO); the Syngenta Foundation for Sustainable Agriculture (SFSA); the Bill & Melinda Gates Foundation (BMGF); and the Swedish Government.